UMA is the University of the Environment in Mexico (http://www.umamexico.com). When visiting Casa UMA in Valle de Bravo, I had the opportunity of experiencing UMA live and in full detail during the master’s degree graduation ceremony. During this experience, I also had the opportunity of observing a variety of dynamics, as well as interviewing and speaking to a few people, including the founding partners. This collective has a very particular way of living, which I believe demonstrates how inspiration can take a person along unknown yet interesting paths, which are only obvious and visible along the way. UMA is still a start-up and has been running for just a few years. UMA’s core focus is active research, where questions are more important than answers, and the search for truth becomes relevant because not everything is black or white. The search for an answer to what we want to maintain and what we want to change is always present. This basic difference is the motor that has driven UMA from day one. The growth of students vs staff – It started with 15 students in the Environmental Entrepreneurship Program (PEA) in 2010, and in 2014 it has over 100 students (70 master’s students, 30 technical certification students and 17 UMA High School students). However, the number of people working within UMA has grown from 6-7 to 18, aside from the network of professors and students that grows every year. 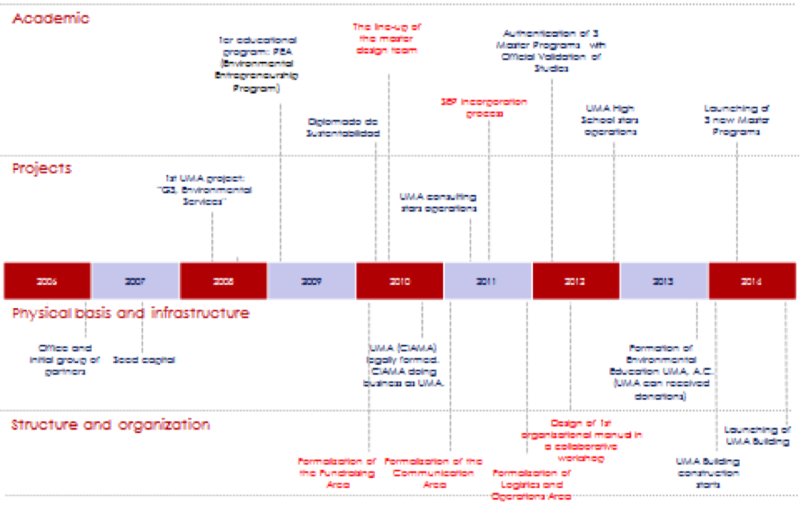 The growth of its programs – they began in 2010 with PEA (Environmental Entrepreneurship Program) and in 2014 they now have 6 master’s programs (Environmental Law and Public Policy, Socio-Environmental Business Administration, Architecture, Design and Sustainable Construction), a Technical Certification in Sustainability, 3 UMA High School groups, Consulting, UMA events and Environmental Education UMA A.C. The growth of infrastructure – It began in 2007 with a small office and the first program (PEA) started in 2009. At the time, the space for programs was somewhere else. In 2014 they are in Casa UMA, a cozy space where they have been able to incubate the second part of their evolution. Today they are about to begin a new journey with the construction of the UMA Campus which will be open at the end of 2014. Incubations of economical/social/environmental projects – 89% of alumni projects are in some stage of development and/or implementation. The first one is the events related to operations and daily UMA activities. Here we can see the events and activities related with the Academic evolution that involves creating and strengthening the programs offered as a University; and we also see the activities related with Project evolution that refers to environmental service consulting and other consulting services that are accomplished with organizations. The second classification is related to strengthening the physical basis and infrastructure, as well as strengthening the structure and organization in order to carry out UMA activities. 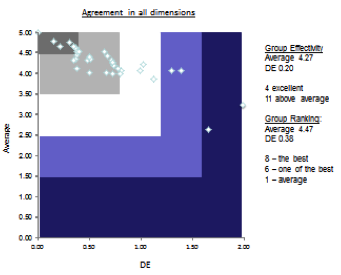 The average standard deviation of all the survey’s answers is relatively low (0.31), which shows shared agreements between people within the collective. We can observe the general results in the graph in Figure 2. The average of the group’s degree of efficiency was of 4.27, where everyone answered excellent and above average. These results indicate that this group could have innovative practices of a mid-high level of harmonic vibrancy. After gathering the evidence, what I can share regarding the UMA practices today (there will certainly be others radically different in several years since evolution is the rule with this group), is captured in the agreements evidence map in Figure 3. An Organizational Philosophy with Zero Dogmas (Levels of Reality) – They are observers, researchers and critical actors of what happens around them, they ask, they seek for each person to live the experience and find their own answers. Questions are a fundamental part of their culture. For example, they develop questions such as the following: what is the middle point between a systemic vision and a reductionist vision because both are valid and necessary, what is the balance between rules and inspiration, what is the proper moment and audience with whom to use horizontal vs. circular organization charts within the same organization at the same time of evolution. Questions such as these may seem strange coming from an Environmental University where they are expected to support new alternative trends, and it may seem to some observers that they are “betraying” evolution. However, seeing it with an open mind, this essence may be perceived as having the capacity to subtly generate spaces for people to find their own answers and develop their full potential. Inspiring and Sharing Global Goal with a Powerful Sense of Group (Group) “To drive a regenerative, sustainable and ethical future by preparing agents of change that are capable of promoting initiatives that will transform social-environmental systems” – Many of these people are there because they know that they are building cathedrals, they know that each part contributes although they cannot see the full picture; they require stability, certain structure and clear guidance on how things work, what they have to do and how to do it. Others are there because deep within them they truly share UMA’s core focus and what it implies regarding uncertainty, risk, patience, tolerance and bravery. They can become part of other types of structures with much more freedom and ability to explore. Both groups are necessary and what is most fascinating is that the initial “strategy” is the same for both groups; as people and groups ask for more or less structure the dialogue begins to take shape around what to do and how to do it. Integrative Co-Design or Sociocracy (Group and Source of Creativity) “None of us knows as much as all of us” – It is clear that co-design is highly important because it allows for various voices and perspectives and imagining something bigger than what one can imagine on one’s own. However, it is also clear that there are situations or decisions that must be done individually but they will be communicated or will guide the team. It means asking oneself constant questions such as: What must be co-designed? Who needs to be there? When must it be done? And so on. It is a live process. In some spaces, it is already clear and in others it emerges as the group grows. Those who study or work in UMA are barely naming this practice as their own; however, having known them for several years, this practice has been consistent. There has always been a thoughtful and conscious invitation for people with different perspectives and voices in designing the UMA that lives in the present. Within UMA, the U process is carried out in each program, generating profound dialogues between all the participants and those who work with UMA. These spaces still have to be strengthened for the operations and staff areas so they can emerge naturally and organically from within; these are steps that are already being identified for the following years. Outside UMA they are involved in processes that allow for this dialogue to be generated within the community, a very beautiful example is the design and construction of the next UMA building which they describe in the following way: “The construction of a building that shows how architectural intervention becomes a means of regeneration for their community and basin.” The projects surrounding the UMA Campus are Housing with the community, Edible forests, a Path system for non-motorized transportation and a project of Social-based construction in Acatitlan. Evaluate in order to grade vs evaluate to redesign; this is a practice that is constantly seeking to create awareness in order to avoid falling into judgment of self or others and instead channeling energy towards growth and evolution. A space that is open to creativity – the objective is set and there is total freedom regarding how to achieve it. This provides a great sense of freedom but also of uncertainty and being overwhelmed by the responsibility; if you “fall” you are 100% responsible for your own fall. However, all this is seen as an opportunity to learn and grow both individually and as an organization. Humanity (Individual, Relationship with the Other) – people are UMA’s most important motor; if people do well, UMA functions well. In evolution, a balance is constantly sought between people’s quality of life and the results. People and their quality of life are taken into account. As with all things, there are ups and downs and matters to resolve as a result of the growth in UMA’s ecosystem. There are still many things that need to be improved before UMA can evolve into the third circle. It is still a collective that falls into the second circle, where evolution depends on the vision of their leaders. They are still in the process of understanding how to find a balance between efficient and flexible operations and freedom and continuous creativity, there are very distinct differences between the experience in spaces made for design and creativity (academia and consulting) and operation and logistics spaces (staff), it is still in the process of financial stabilization, etc. Leaders and other emerging co-hosts are aware of this, they are observing and seeking more questions and answers; part of this evolution will most likely depend on the increasing awareness of their co-hosts. I don’t know if the reader will be immensely curious as to the direction this is heading and as to what it will look like in the future; what I do know is that I for one, am very curious. I perceive that UMA has the potential of becoming a point of reference for organizations on how to design and evolve start-up structures with live and free processes that create possibilities in the world (possibility-light), while staying grounded and putting forth all the potential in the earthly world (things-matter). This first attempt to understand the practices and agreements that they have generated throughout time may shed some light for those entrepreneurs who are willing to live this experience through a different lens. Building on Annabel’s innovations on bringing a body experience to the Introduction to Ecosynomics course, I used the same exercises she developed for the Relationship to Self, Other, and Group. I tried different exercises for the Relationship to Nature and Spirit. For the Relationship to Nature, standing outside in a beautiful forrest setting, we experienced: (1) how many things can you see? [noun-outcomes level]; (2) what can you see that does not change over time? [verb-development level]; (3) what could you imagine being in here and see it here? [possibility-light level]. For the Relationship to Spirit, we went into the library of the facility we were using, and picked a book. We then experienced: (1) point at 2 specific ideas in the text you picked; (2) notice 5 thoughts you have about those 2 ideas; (3) imagine everyone here taking on those ideas for themselves. The experiences people had were really cool, finding themselves in their own experiences of the five relationships, in just 2 hours. When I was designing an Introductory Experience of Harmonic Vibrancy, some questions came to my mind: can I find a real experience for the group? An experience that talks not just to their mind, but makes them feel it in their body and will? I did not want to start with their mind in the very beginning, and that was a bit difficult for me, since I am so accustomed to work with my mind. Then an inspiring moment gave me some ideas of how to do this. Feeling each relationship in the body. I believe there is a way to get people to feel Harmonic Vibrancy. I did this body experience in about an hour and a half. The I, Other, and Group relationships were easier to experience in the physical. I still need a good form of body experience for the relationships to Nature and Spirit. For each one of the relationships, I ask the participants to put themselves in one of the postures for a minute, and then write down on a post-it what they feel and think. I do not have pictures of people doing the postures; however, the I and Other are pretty straightforward. In the case of the relationship to the Group, the lower level was very interesting. The image below can help to make sense of the posture I asked them to do as a group. People said things like they could not see more than the person in front of them. They felt static. Some of them said they did not have feelings, and were uninterested, with their minds going to a different place. Some wanted to touch the person in front, and turn to see the person behind; so, it was a very nice way to make them feel the lower level of the relationship to the Group. In the case of the relationship to Nature, I gave them an object (the carton at the end of a roll of toilet paper works very nicely). I told them what it was, and then asked the group what was the purpose of the object. At first everyone answer what I told them, that is the Things level of perceived reality. Then, in the case of toilet paper roll, they told me they have garbage in their hands. When I asked them about what could they do with the object, a lot of ideas came in, that is the development-verb level. Finally, some ideas that were beyond the object helped explain what we can imagine when we are in the light level. I linked this same exercise to the relationship to Spirit, to discover how to experience this through the body. The first experience of Naming. Language is so important for the process of experiencing harmonic vibrancy, and sometimes we find it difficult to listen to ourselves and to others in the collectives we are part of. So, what I did is to give the group famous phrases from philosophers, singers, popular sayings from Mexico. Some of these are in the Ecosynomics book, and some are not. Some are long; some are short. Some examples of the short ones include: “There is a crack in everything. That’s how the light gets in” from Leonard Cohen; “Tree that is born crooked, his trunk never straightens,” a popular saying; “We only see what we animate, and we animate what we see” from Emerson. I asked the group to identify the primary relationship(s) and the level of each phrase. I emphasized that they could sense the level of perceived reality just by listening to the language they used. The first 4-5 hours of the 12-hour workshop were dedicated to these two activities. After that we worked more and more with the mind, learning what agreements are, understanding the three paths through the three levels of perceived reality, analyzing their responses to the harmonic vibrancy survey, and analyzing Agreements Maps for different groups. I believe that the success of these other exercises rested on the two exercises of the first 4 hours. At the end I did a small exercise of “mindfully eating chocolate,” to close the workshop reminding them that the more mindful we are, the more we can really help collectives to name agreements and realize what to do next. I look forward to learning what you and others have found useful in engaging people with their mind, heart and will from the very beginning of the harmonic vibrancy experience. I know that we will continue to improve and innovate from this point forward to make this introduction a real experience of what Harmonic Vibrancy is. Annabel Membrillo Jimenez, ISC Fellow, is the Vibrancy Ins. representative for Harmonic Vibrancy and Ecosynomics in Mexico. Through her consulting, coaching, and teaching, Annabel has brought harmonic vibrancy, and strategic clarity to individuals, organizations, and communities in Mexico since 1995. A graduate with honors of the ITAM, she has co-authored articles you can find at ISC. I just spent the last week in Queretaro, Mexico, where there is lots of activity around the work of Harmonic Vibrancy and Ecosynomics, and there is much to share. As I tell you briefly about what is happening in Mexico, I invite you to see if there is a way that you would like to engage with the work there or something similar in your geography or language. Basically, you can think of four realms of work: “content” where you learn to do the work on your own; “process” where others do the work with you; “sharing” where you meet others like you who are doing the work; and “insights” where you learn about the underlying research and insights we are finding. As the group now takes up these introductory and intermediate courses, I will be back in Mexico in the early Spring to offer more advanced, specialized Intensives on Money Agreements, What Is Homo lumens, Collaborating with Process Groups around the World, An Integral-AQAL View of HV and Ecosynomics, Introduction to Ecosynomics research seminar, Linking Ecosynomics, Harmonic Vibrancy and Strategy, and The Ecosynomic Foundations and Practices of Agreements. With these solid foundations in the team in Mexico, we can now explore the deeper roots and practical applications of Ecosynomics. Through its long-term work with Ecosynomics, the community in Mexico continues to be one of the top 3 countries in purchases of the Ecosynomics book-course. We shared the story with like-minded leaders and colleagues through two public talks and dialogs. One for 42 leaders was hosted by the SC Group and the JFK American School of Queretaro, with co-hosting by Annabel’s team. The other public talk for a dozen local leaders was hosted by the SC group at the Esquina Gaucha restaurant. 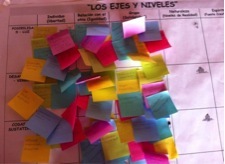 These sharing activities continue to grow the local community working with Ecosynomics in the Queretaro area. Through ISC Fellow Annabel Membrillo and SC Group Mexico co-founder Conrado Garcia, there are now two large on-going projects in Queretaro, Mexico based in Ecosynomics at the school JFK and the bank ISBAN, integrating the Harmonic Vibrancy survey, the Agreements Maps, and Managing from Clarity systems mapping in the strategy process. If you are interested in engaging in any of these areas of Content, Process, Sharing, or Insights in Mexico, contact the SC Group. In 4 Salons, a dinner, and an Intensive this Spring, 150 Mexican leaders explored the experience of harmonic vibrancy and the Ecosynomics of agreements. Towards the Education part of ISC’s charter, Jim Ritchie-Dunham has been working with ISC Fellows in Europe, USA, and Mexico to engage ever broader communities of people in the work of Ecosynomics. The ISC courses now focus at three levels: a 2-hour, experiential overview we call a Salon; introductory courses taught by ISC Fellows; and 3-day, in-depth Intensives with Jim R-D. The Salons provide a 2-hour, interactive experience of the choice and agreements in the experience of harmonic vibrancy and the abundance-based principles supporting that experience. The Intensive dives deeply into the Ecosynomics framework and its supporting tools. Following up on a Salon in Boston in the fall 2012, a series of Salons across Germany in the fall 2012, and an Intensive in Massachusetts in December 2012, we just completed a series in Mexico. Over three days at the Casa de Aves (Spanish for birdhouse), a beautiful resort in San Miguel de Allende, 3 hours north of Mexico City in Mexico, five students of Ecosynomics dove into the depths of the theory and practice with ISC President Jim Ritchie-Dunham. In the evenings, they helped facilitate four two-hour Salons and a dinner hosted by the Council of Entrepreneurs of San Miguel de Allende, ISBAN of the Santander Group, and the Argentinian restaurant La Esquina Gaucha. ISC colleagues at the SC Group, Conrado Garcia, America Rodriguez, and Jaime Martinez, hosted and coordinated the whole event. The SC Group is now coordinating a series of Intensives and Salons in Mexico for the early fall 2013. Additional Intensives are being planned for May in Massachusetts and June in North Carolina. If you are interested in hosting or participating in a Salon or Intensive, please contact Jim R-D.